Artificial neural networks have long been studied with the hope of achieving a machine with the human capability to learn. Today’s attempts at artificial neural networks are built upon Hebb’s rule, which Dr. Donald Hebb proposed in 1949 as how neurons adjust the strength of their connections. Since Hebb, other “rules” of neural learning have been introduced to refine Hebb’s rule, such as spike-timing dependent plasticity (STDP). All of this helps us understand our brains, but makes developing artificial neurons even more challenging. A biological neural network is too complex to exactly map into an artificial neural network. But IBM mathematician Takayuki Osogami and his team at IBM Research-Tokyomight have figured it out by developing artificial neurons that mathematically mimic STDP to learn words, images, and even music. Takayuki’s mathematical neurons form a new artificial neural network, creating a dynamic Boltzmann machine (DyBM) that can learn about information from multiple contexts through training. The “1s” equate to the lines making up the letters, while the “0s” translate to the white space around the letters. What these seven neurons can do all at once is read and write 7-bit information. The word “SCIENCE” is expressed as 7-bit x 35-bit of pattern sequences that equals a 245 bits monochrome bitmap image. These seven neurons read and memorized each piece of the 7-bit information in the image. For example, “0100010” is the tenth column of the whole image according to the learning order, and the neurons recall those pieces in the order they learned them. By memorizing the word from left to right and from right to left, the neurons could recognize “SCIENCE” forward and backward, or in any order – like how we might solve a jumble word puzzle or crossword puzzle. Things get more complicated (and interesting) when these artificial neurons learn about different topics in different formats, such as the human evolution image, below. Takayuki’s team put 20 artificial neurons to the task of learning this image, which shows how we humans have evolved, from left to right. Why they used 20 artificial neurons this time? One column of the image showing the human evolution consists of 20 bits, and they made it consistent with it. These neurons learned how the pieces of the image line up in the correct order of evolution – from apes to Homo sapiens. As Takayuki runs simulation, these neurons learn more over time, while detecting the mistakes they make – and making corrections per simulation. With each simulation, the neurons generate an image to show their progress in re-creating the image. It took just 19 seconds for the 20 neurons to learn the image correctly, as mapped out below. Images and text are one thing. But neurons encompass all senses. So, Takayuki’s team put 12 of their artificial neurons to work learning music. Using a simplified version of the German folk song, Ich bin ein Musikante, each neuron was assigned to one of the 12 notes (Fa, So, Ra, Ti, Do, Re, Mi, Fa, So, Ra, Ti, Do). After 900,000 training sessions, they learned the sequential patterns of tones to the point of being able to generate a simplified version of the song. The neurons learn music much like we might: repetition from beginning to end to the point of memorization. Currently, the 12 neurons only generate quarter notes, but simply doubling the neurons to 24 gives the system the ability to comprehend half-notes. 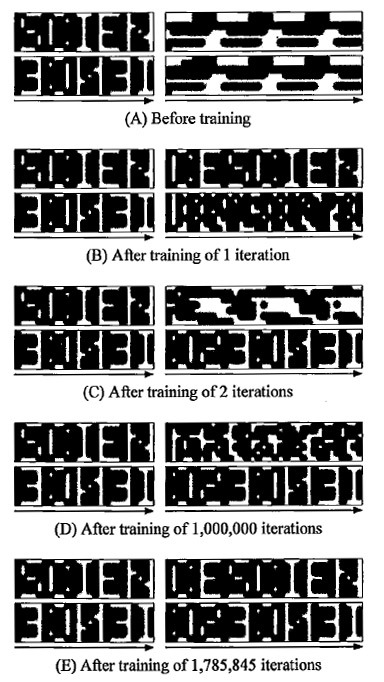 Takayuki’s DyBM not only memorizes and recalls sequential patterns, but it can also detect anomalies in sequential patterns, and make predictions about future patterns. It could be used to predict driving risks through car-mounted cameras, or generate new music, or even detect and correct grammatical errors in text. 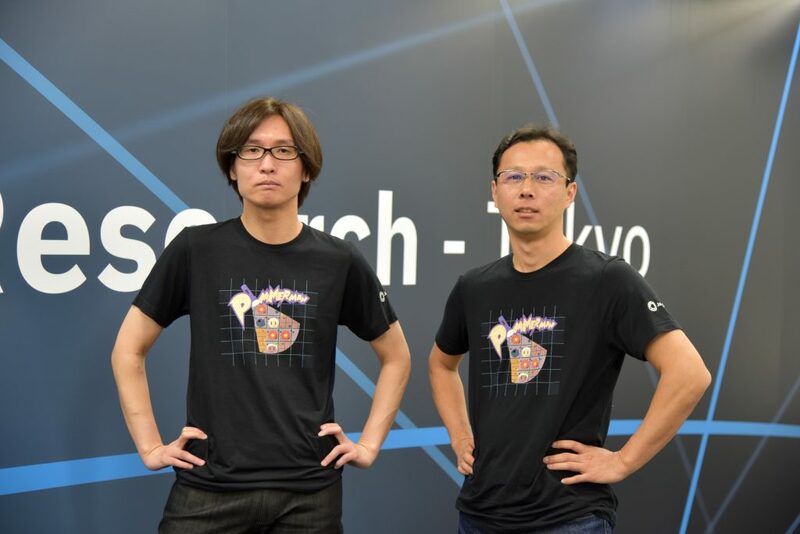 Takayuki’s work, currently funded by the Japan Science and Technology Agency’s Core Research for Evolutionary Science and Technology (CREST), hopes to advance his DyBM by integrating it with reinforcement learning techniques to optimally act on the basis of such anomaly detection and prediction. The scientific paper Seven neurons memorizingsequences of alphabetical images via spike-timing dependent plasticity by Takayuki Osogami and Makoto Otsuka appears in Scientific Reports of the Nature Publishing Group on September 16, 2015, DOI: 10.1038/SREP14149.